I'm not much of a flower person, unless of course they are a companion flowers for vegetables or edible ones like nasturtiums. marigolds, borage, pansy, cornflower, violets, saying that I do like posy of scented sweet peas. Today, I thought I would share a some flowers that are coming up in the front of our new house (not the back garden where we are planning to just grow vegetables). Every other day, there is a new stem of colour that has emerged from the ground to surprise us, it makes me smile. This has delighted me as I was going to (and probably still will) throw some wild flower seeds, as the garden romantic in me would like the bees and butterflies to flutter by and enjoy as they go by their merry business. For now, I am enjoying seeing what different flowers pop up here and there, many I do not know the name of, but these I do - tulips. The tulips have replaced the daffodils. So why true lips, tulips ? One of my nephews just could not say the word tulips, so I said to him say true lips, he did. I encouraged him to keep repeating it. Then I said remove the R and try saying it. He was able to say tue-lips and kept repeating it until it was natural - Tulips. He smiled.. I am enjoying the tulips while they stand proud, not for long as the rain is giving them a good hard battering. 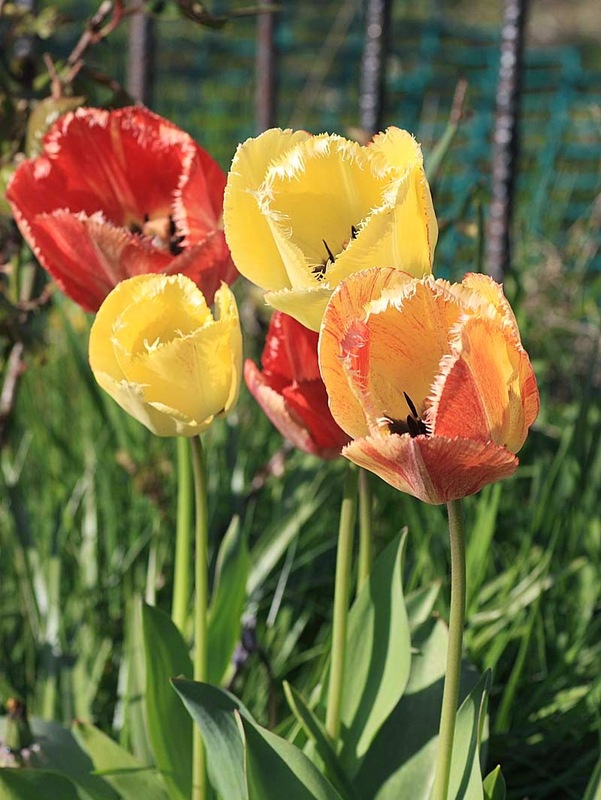 Tulips are so pretty, but it's true, they don't last long, especially not in rainy or windy weather. I am always a bit disappointed if I put them in a vase as the stems bend and the flowers open very wide. Perhaps they are best left to admire where they grow. 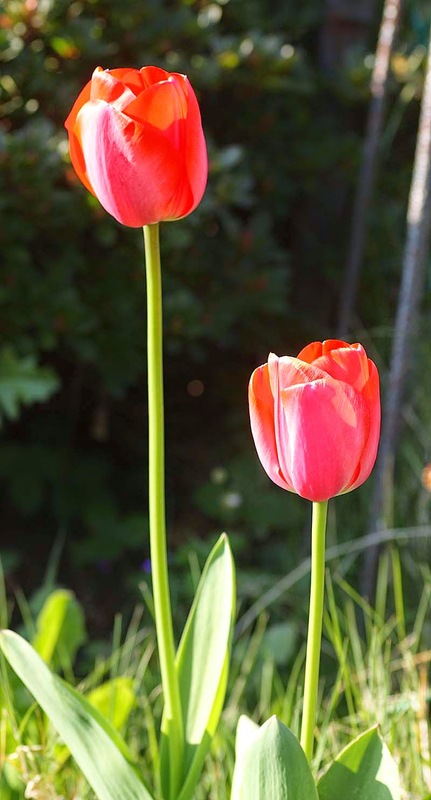 We have some red tulips like yours in our back garden at the moment. Thank you. I am not picking these at all - will just admire as they grow and fall loopy. Hope your well.